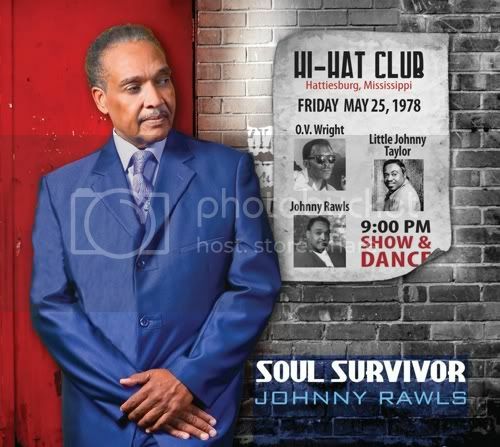 Blues Music Award-winner Johnny Rawls will follow up his 2011 album Memphis Still Got Soul on June 19 when he releases Soul Survivor through Catfood Records. Memphis Still Got Soul garnered multiple nominations for Rawls at last month's 33rd Blues Music Awards and he is wasting no time following it up with this latest record. The 10-track Soul Survivor features nine originals, penned mostly by Rawls and producer Bob Trenchard. The tenth song is once again a tribute to Rawls' mentor, soul legend O.V. Wright. Rawls often records one of his former boss' songs and this time he puts his spin on Wright's "Eight Men, Four Women." Rawls is backed on the new record by drummer Richy Puga, keyboardist Dan Ferguson, guitarist Johnny McGhee, and producer Trenchard handled bass chores. He is also joined by a horn section that includes Andy Roman (saxophone), Mike Middleton (trumpet), and Robert Claiborne (trombone) and backing vocalists Jessica Ivey and Jillian Ivey. The Columbia, Mississippi native has been touring as a solo artist since 1985 and has won numerous awards including Soul Blues Album Of The Year for his 2010 record Ace Of Spades and has played all over the world. He's among the most consistent soul-blues artists on the circuit and shows no signs of slowing down any time soon.